Director Lee Jun-Ik’s historical film The King and The Clown was a big commercial hit in Korea when it was released in 2005. Critics also raved over the film. 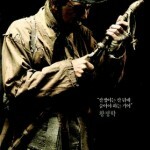 It would go on to break box office records in South Korea and also be included in many critics’ lists for that year. Even though his subsequent work has failed to match his creative and financial success with The King and The Clown, his involvement in that movie has ensured that he remains one of Korea’s most highly watched directors. Doesn’t “legendary blind swordsman” describe a very famous character in Japanese legend and film? Based on a promo shot of the blind swordsman, it does look like Lee has taken inspiration from the legendary Zatoichi. I won’t be surprised if Lee’s movie will also borrow some elements and plot points from the Zatoichi story. I still look forward to the movie though.